Get expert cleaners for your end of tenancy cleaning in Manchester. Book an experienced team, who come in, work through and get the job done. Move into your new home knowing you’ve left the past neatly to rest behind you. Most important of all, be sure that your move out cleaning responsibilities will be completed by people who know exactly what your landlord or letting agents are looking for. Every task will be ticked off a list and there’ll be no reason for you to lose any part of your cleaning deposit. Get a free quote any time: This will be based on the size of your property and includes all labour, equipment and cleaning products. Count on 24/7 support from our office team: Contact us over the phone, through our live chat, or by filling in our contact form. Get guaranteed cleaning: If anything doesn’t meet your landlords approval tell us within 48 hours of your service. We’ll return and re-clean- for free! Book your service when you need it: We work 7 days a week, we don’t charge extra for weekends. And we’ll even clean overnight. Get discounts: When you book certain extra tasks. Oven cleaning is included as standard, window cleaning puts the finishing polish on the job. When you don’t want to rely on your tenants for the move out cleaning, hand it over to us. You know it’ll be done right. You get a quick turn-around. You maximise the value of your rental investment. And as a repeat or regular client you may be offered advantageous rates. As landlord or tenant you’ll get the same high quality work. Every task associated with getting rid of all evidence of the old occupants and preparing a home for the new is taken care of. That means all the floors will be mopped or hovered, bins are emptied, work surfaces wiped down. Bathrooms are deep cleaned, kitchen appliances are cleaned inside and out. All sinks are polished and taps de-scaled. There will be no hair left in drain holes and no crumbs in the toaster. Our experienced cleaners work through a check-list for end of tenancy cleaning, ticking chores off as they’re completed. There’s no time limit on your tenancy cleaning, you’ve paid for the job and your team will stay until it’s done. Ask for a copy of our end of tenancy check list if you’d like to see everything that’s included. All our cleaners are reference and CRB vetted before starting to work with customers. That’s a good start, but you need competency as well as honesty. We look for individuals with a commitment to delivering a fair days work for a fair day’s pay. 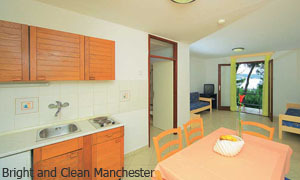 Your cleaners are specifically trained to deliver after tenancy cleaning in Manchester. We have an ongoing quality control monitoring system in place too. Just to finish things off professionally your work is covered by full insurance. So, give us a call and find out more about the end of tenancy cleaning that’s guaranteed to give the results you want.